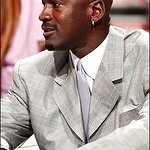 Michael Jordan is set to put his cards on the table this week when he joins his old friend Trent Tucker at the annual Trent Tucker Charity Golf and Poker Tournament. “A Weekend of Fun and a Lifetime of Impact” is the theme of the event, which raises money for the Trent Tucker Youth Program – an organization established by Tucker in 2001 to help at-risk youth by developing the skills they need to make positive choices. 2008 sees the tenth year that Trent Tucker has hosted the fundraiser, with over $1 million being raised since 1998 for local charities and the Trent Tucker Youth Program. Jordan has attended every year, and last year won the poker tournament. The poker tournament kicks off at Running Aces Harness Park in Columbus, Minneapolis, on Thursday, September 11. Spectators are welcome at a cost of $50. An invitation-only celebrity VIP reception is set for Friday, followed by an open-to-the-public party at the Epic in Minneapolis. The golf tournament will be held Saturday, September 13, at Rush Creek Golf Club, Maple Grove. For more information about tickets, visit www.trenttucker.org.